Love art but think you could never be so creative? Yes, you can! 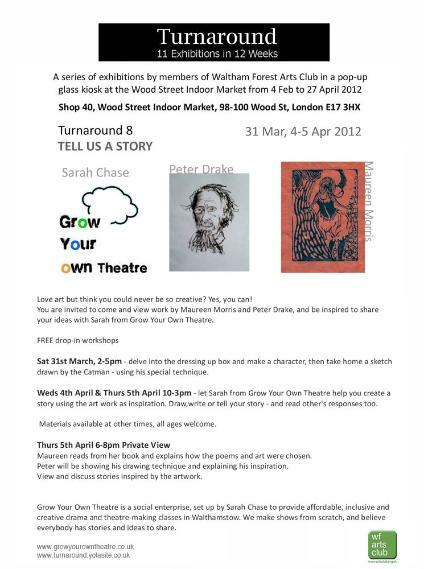 You are invited to come and view work by Peter Drake and Maureen Morris and be inspired to share your ideas with Sarah Chase from Grow Your Own Theatre. Delve into the dressing up box and make a character, then take home a sketch drawn by the Catman - using his special technique. Let Sarah from Grow Your Own Theatre help you create a story using the art work as inspiration. Draw, write or tell your story - and read other's responses too. Materials available at other times, all ages welcome. Maureen reads from her book and explains how the poems and art were chosen. Peter Drake will be showing his drawing technique and explaining his inspiration. View and discuss stories inspired by the artwork. Let Sarah from Grow Your Own Theatre help you create a story to add to our story board. Grow Your Own Theatre is a social enterprise, set up by Sarah Chase to provide affordable, inclusive and creative drama and theatre-making classes in Walthamstow. We make shows from scratch, and believe everybody has stories and ideas to share. In addition to drawing and painting Peter Drake creates short videos of his quick-draw portraits of popular personalities. His technique involves drawing with his left hand while videoing with his mobile phone using his right hand. "I like working with relief prints because I can print by hand and don't have to use a press - though I do use one sometimes! I enjoy wood and letting the tools release the image - in the big cacti piece it was fun to involve the grain and the knots in the plank. 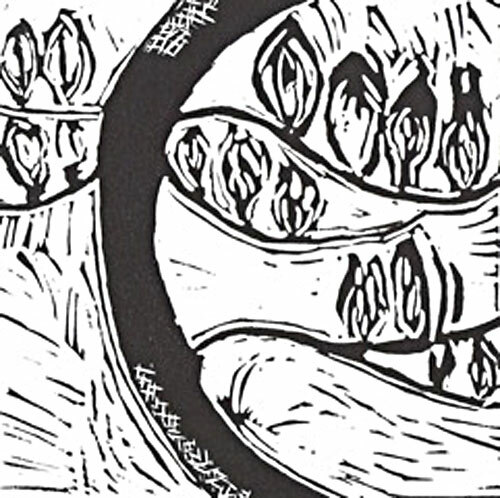 I often work directly onto the material, even when I'm making wood engravings - it keeps the image spontaneous. The big cacti piece takes about half an hour to ink up and it can take another hour to bring the image through using a baren - it's a very meditative process. I'm fascinated by cacti plants and have done the very small wood engraving of a group of cacti too , which was in the 1st turnaround."